Valcourt, Quebec, February 1, 2019 – BRP maintains its high standards of creativity thanks to the quality of its design and innovation team. 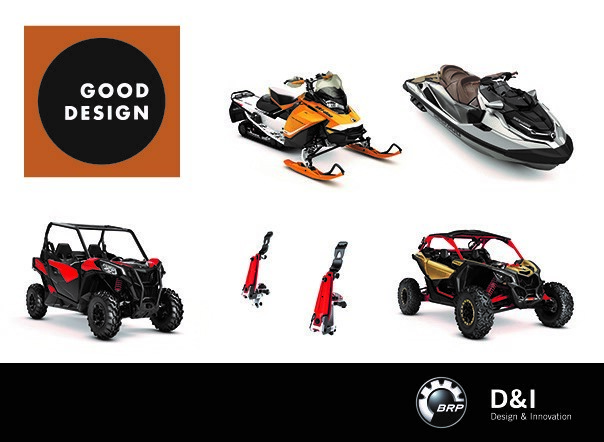 The team’s talent and efforts were recognized on December 10, 2018, with five Good Design USA awards, making this a record year with 15 design awards for 2018. The winners were the Can-Am Maverick Trail, the Can-Am Maverick X3 MAX, the Sea-Doo GTX, the LinQ system and the Ski-Doo Renegade 900. “Recognition from our peers is extremely rewarding. There’s always a great sense of satisfaction and pride when other designers, members of the jury, react to our product’s inventiveness with a ‘wow’ and appreciate our work,” declared Denys Lapointe, Senior Vice-President, Design, Innovation and Creative Services. “By pooling the talent of designers, engineers and marketers, we succeed in creating something people value, and we differentiate ourselves from our competitors,” he added. This latest collection of awards brings the total for the team to 15 in 2018. Every year, BRP shines brighter on the world stage for design, standing alongside the transportation industry’s biggest players. The emphasis of the Good Design USAprogram is on quality design, of the highest form, function, and aesthetics – a standard beyond ordinary consumer products and graphics. Submissions to the program are judged by a jury of distinguished design professionals, leading industry specialists and design press, on criteria established in the original 1950 program for the highest aesthetic in terms of innovative design, new technologies, form, materials, construction, concept, function, utility, and energy efficiency, as well as sensitivity to the environment.